Fairy tale (and myth) retellings are a particular weakness of mine. The last time I met up with my DC FYA book club, someone joked that if they named any story, I could come up with a young adult or middle grade retelling of it. I laughed with everyone else, but when they tested the hypothesis with two stories, I snapped right back with several titles of retellings. I guess I read predictably? *grin* Earlier this year I picked up Rosamund Hodge’s debut novel Cruel Beauty, which was a fascinating mash-up of several legends, myths and tales. 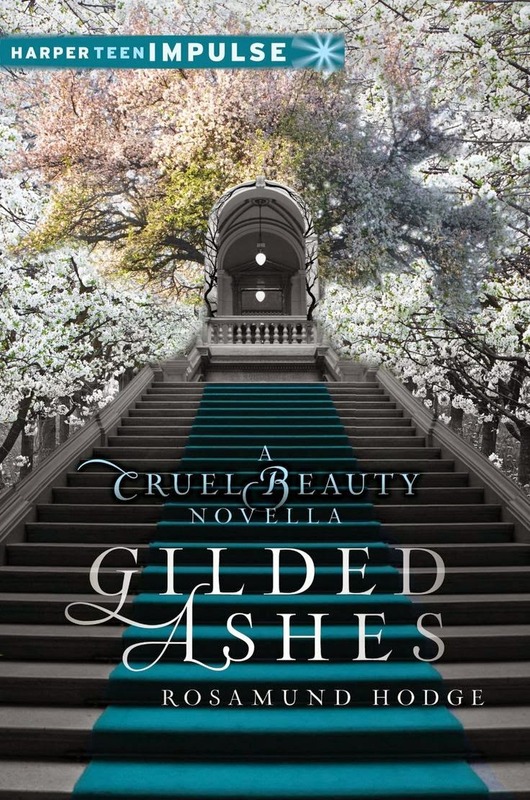 Then recently I borrowed a library ebook of Hodge’s Gilded Ashes, a Cinderella retelling/companion novella set in the same world as Cruel Beauty. It was just as good as (or possibly better than!) Hodge’s first story, which is saying something. A romantic reimagining of the classic Cinderella fairy tale, Gilded Ashes is a novella by Rosamund Hodge set in the same world as her debut novel, Cruel Beauty. Maia doesn't see the point of love when it only brings people pain: her dead mother haunts anyone who hurts Maia, and her stepsisters are desperate for their mother's approval, even though she despises them. Meanwhile, Anax, heir to the Duke of Sardis, doesn't believe in love either—not since he discovered that his childhood sweetheart was only using him for his noble title. But when Maia's and Anax's paths cross before the royal ball, they discover that love might not be the curse they once thought. And it might even be the one thing that can save them both. What if Cinderella was complicit in her own abuse so as not to stir up even darker horrors? Maia lives a precarious half-life: she serves her stepmother and stepsisters not because she is unloved (though that is true in her stepmother and stepsister’s case), but because she is too much loved by her mother’s ghost. Maia’s mother made a devil’s bargain with The Gentle Lord before she died, and Maia has been navigating a truly horrible existence ever since. When the Duke’s son Lord Anax decides to take a wife at an upcoming ball, Maia believes it may be a chance to find a way out of her father’s house. The trouble is that Lord Anax is a wildcard, and Maia has been well-trained never to act on the longings of her own heart. Well! This may be one of the most twisted Cinderella retellings I’ve ever encountered. The ghost of Maia’s mother is just one of the ‘villains’ of the piece. All of the antagonists (and there are several) are of the complex, gray-area variety, though that doesn’t make them any less dangerous. Meanwhile, protagonist Maia is a self-sacrificing liar. If that didn’t spark your interest, I give up. Really, though, this is a quite a story. And even though there are dark elements, I would say that Gilded Ashes is an examination of what love truly is: caring enough to sacrifice yourself, being able to tell someone not only the Truth, but your own truths, and making the kinds of decisions that ensure another’s happiness. The tone is grim and desperate (rather like Maia’s life), but there’s also an unquenchable hope at the center of it all. That is the thing that keeps this tale in YA territory (and turns horror into something romantic). As you can guess from that last sentence, there is a budding relationship that grows in the thorny soil of Maia’s life. However, I would not call it the central focus. The main bulk of the story revolves around the effects of individuals’ choices in a world that is built upon the magic of demons. Final verdict? Hodge uses the novella form to tell a deliciously dark fairy tale of Faustian bargains, danger, and love. Recommended for: fans of fairy tale retellings and young adult fantasy, and Cinderella stories in particular (examples: Lili St. Crow’s Wayfarer and Mercedes Lackey’s Phoenix and Ashes). Rosamund Hodge definitely doesn't do standard retellings! Could you please note when books are written in first person present? I hate that and just wasted my money buying a novella that I'm stopping reading at after one paragraph. Ugh. Gaia: Thank you for your comment! I only mention tense in a review when it was something that bugged *me* (for instance, I personally think that 2nd person ANYthing is horrid! ), so I can't promise to always note that going forward. I'm sorry that you won't be reading this one - I felt it really was beautiful, regardless of tense. I know that other reviewers often note tense on Amazon and Goodreads - you may get a clearer picture from reviews on one of those sites.